Email marketing A/B tests (also referred to as split tests) are one of the few practices marketers employ to improve the performance of their email campaigns. By comparing two variations of the same email it helps create a more solid understanding of your audience and what kind of content they respond to. The practice is designed to give marketers the data they need to iterate and improve on the emails they send in the future. Ideally each test should teach you one new thing about your audience. The more we know about our target audience the less we need to assume and guess. Now, marketers know they should be performing A/B tests, but many get lost as to what they should/could be testing. That's why I wanted to write an article to help point you in the right direction. In this article, I’ll give you a brief step-by-step of how to perform an A/B test, and show you 7 examples of easy email marketing A/B tests you can do in 5-minutes. At the end you should come away with a few ideas of what you'd like to learn about your audience and what you can A/B test for yourself. Take a small sample of your email list, or split your entire list into two. Send out two emails, with two variations (called “A” and “B”). In A/B testing, the “A” is the control group, the “B” is the variant group. Track your results for the best open rate, views, click-through rate and/or sales conversion. Use the best email test to send out to the majority of your list. Improve your results with little effort. Note that you don’t have to test everything for every email campaign. If you’re new to it, or you don’t have a lot of resources for your email marketing - try out a few of these simple tests. I’ll soon show you examples of how to test your subject line, email body, Call to Actions, and times to send. To give you a good understanding of A/B testing your email, I’m using a real email example from a recently successful campaign we sent. I’ll use the example to go through a number of split tests you can act on to give you the most optimized results. Our marketing objectives for the campaign were to nurture leads and ultimately increase sign-ups to our Wishpond VIP demo. We sent out the email to a targeted segment. Your subject line is what grabs the attention of your prospect. It plays a massive role as to whether your email gets opened and viewed - the essential first steps in getting to the sale. Test your subject line to give yourself the biggest bang for your efforts. There are tons of ways you can test your subject lines. Personalizing your subject line means adding your recipients name, or other personal information you have about your prospects. We tested adding personalization vs. not adding personalization with a small segment of our lists. The difference in open rates was small, but we chose to use the slightly higher results. For you, or for another one of email campaigns, adding personalization might increase your sales. Test it and use the best results. Making your subject line personal can be as simple as adding “you”. The clear winner was the subject line ‘A’ (with “you”), with an open rate of 37% vs. a mere 26% with no “you”. The general rule of thumb for subject lines is keep them short. You’re grabbing the attention of your prospect, and your email is one of many they’re receiving in a day. But, even though a short subject line generally results in Opens, you need to test yours to determine what the optimal length is for your niche list, industry and specific campaign. If your line is too short, you may not be giving your prospects enough information to entice them. In this example, the shorter subject line was the most effective, with a 37% open rate compared to a 32% open rate for a longer, but more friendly, subject line. Your email body copy is what convinces your prospects to take the next step in the sales conversion process. Write an email copy that connects, and you’ll get that coveted click-through. Write an email that flops, and you’re back to square one. You can pretty easily increase your ROI by taking the time and making the effort to test a few simple tweaks in your copy. There’s good reason to send out emails with text only. Text only is easier to view on mobile - and 61% of brand emails are viewed on phones and tablets. There’s good reason to send out emails with visuals and text too. Visuals can make your email much more appealing. 67% of consumers consider clear, detailed images to carry more weight than product information or customer ratings. To get the best results, send out your A/B test to a large portion of your targeted email list - if not your entire list. In this case, the visual proved to significantly more effective at gaining conversions. Try it for your next email marketing campaign. You can take this test further by changing the visuals for size, image, place of image, number of visuals, and tons more. Write two email bodies. Make one a soft sell, with the goal to nurture your leads. Make one a hard sell, with the goal to gain immediate sales. For example, make one email to direct prospects to your content, and include a link to your sales funnel landing page too. Make one email to direct prospects directly to your sales funnel landing page. Now, ultimately, with all the content and social media you do, your ultimate goal is to get the sale. Often nurturing your leads will build that trust for prospects to take that next step. These results show that our soft sell - by giving people free information related to their business interests - resulted in a higher click through to our free VIP Demo. Another good A/B test for your body is your copy tone. If you have a diverse customer base, or you are targeting a variety of demographics, test out different colloquialisms and tone of voice to determine what gets you the best results for your campaign objectives. “It’s 2014. How informed are you about the current state of social media? In this presentation we give you 15 statistics that might open your eyes about where you should focus your efforts in 2014 (and some that will just plain surprise you). These statistics are as current as they get, some of them only a couple days old. Check it out! We know you’re very busy planning for the 2014 year. Wishpond is here to give your business what it needs. In our latest slideshare, we’ve collated the best - and most recent - social media statistics from around the web. Keep on top of the latest marketing trends. 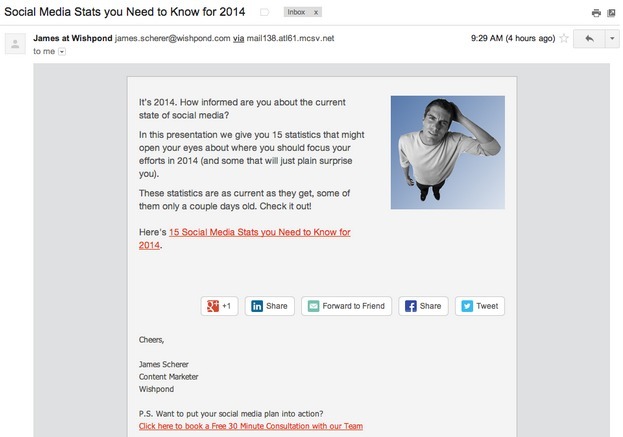 Here’s 15 Social Media Stats you Need to Know for 2014. Split your email list, and send the two copies to test which message gives you the best results. Your CTA is what invokes the important click through. Is your CTA the right offer? Does it give your recipients the action word? Would a difference in where your CTA is in the context of you email make a difference? You’ve likely found that your recipients respond better to your emails on certain days, and maybe even certain times of the day. Do all of your recipient segments respond the same? How about the results you get from your frequency of emails? A/B testing is an essential part of your email marketing campaigns. Without bettering your results, you really are wasting your lead generation efforts. Take the time and smarts to test, test, test. What do you think? Do you A/B test your emails? How have your results improved? What tips do you have?